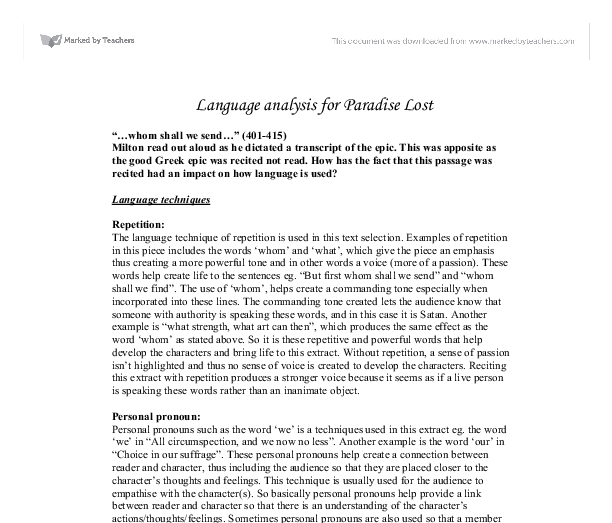 Language analysis for Paradise Lost "...whom shall we send..." (401-415) Milton read out aloud as he dictated a transcript of the epic. This was apposite as the good Greek epic was recited not read. How has the fact that this passage was recited had an impact on how language is used? 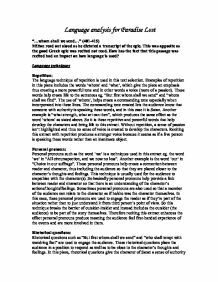 Language techniques Repetition: The language technique of repetition is used in this text selection. Examples of repetition in this piece includes the words 'whom' and 'what', which give the piece an emphasis thus creating a more powerful tone and in other words a voice (more of a passion). These words help create life to the sentences eg. "But first whom shall we send" and "whom shall we find". The use of 'whom', helps create a commanding tone especially when incorporated into these lines. The commanding tone created lets the audience know that someone with authority is speaking these words, and in this case it is Satan. Another example is "what strength, what art can then", which produces the same effect as the word 'whom' as stated above. So it is these repetitive and powerful words that help develop the characters and bring life to this extract. Without repetition, a sense of passion isn't highlighted and thus no sense of voice is created to develop the characters. Reciting this extract with repetition produces a stronger voice because it seems as if a live person is speaking these words rather than an inanimate object. ...read more. Reciting with this technique incorporated will make the audience feel as though they are addressed more directly. That's why it is more apposite for this piece to be recited rather than read. Adjectives/imagery: Visually powerful adjectives are used in this extract to help produce a powerful image for the audience to picture. An example of such includes 'dark unbottom'd infinite' in the line "The dark unbottom'd infinite Abyss". A powerful image of a dark never-ending bottomless pit is portrayed by this line. This shows that adjectives are used affectively to achieve their purpose. Adjectives are meant to be used to create a visual image for the mind to picture of a scene, event or object. This can only be achieved by use of strong descriptive words otherwise the mind cannot picture what is described. Adjectives are used in this extract because the writer wants to involve the audience so that they feel as though they are part of the story. So adjectives contribute significantly to the compiling of this extract and without them, Milton cannot share his ideas with the responder. This technique when incorporated produces a powerful way of communicating Milton's ideas across to the audience when recited, because his words seem to come alive as images created seem so real due to the visually powerful adjectives used. Emotive language/hyperbole: Emotive language is present in the line, "The weight of all our last hope relies." ...read more. That's why the recital of this piece is more appropriate than reading it. Oxymoron: The use of an oxymoron is quite effective when trying to compare something to something quite opposite to itself eg. an oxymoron could be something as plain as 'a cold fire'. From this example, it could mean something that seems welcoming but at the same time quite disturbing eg. the cry of a baby. However an oxymoron can be interpreted in many ways. In this extract, examples of an oxymoron are 'palpable obscure' and 'vast abrupt'. There is a contrast of the words palpable and obscure in the first example. One meaning could be that something is so obvious but yet outrageous to be true. An example is the quote 'the most dangerous place is the most safest place' (meaning the most obvious place is the most safest place because no one consider looking there believing that no one would think of such a place in the first place). In this case, this would be referring to Earth but perhaps implying that a venture into the unknown (Earth) would be unconsidered by God himself. There is also a contrast of the words vast and abrupt in the other example. This sentence can be interpreted as a task so small but yet so big meaning that the task is so small but so difficult to perform, that's why it seems so big. The effects of an oxymoron are improved when spoken aloud rather than read because an emphasis is produced on these words when done so. ...read more. The most key symbol apparent right through the play is that of the paranoia about communism that arose in America in 1950; similarly to The Crucible, suspected Communists were told to confess their crime as well as telling the higher power of any Communist names. It also makes us feel that the King isn't there, but there are people representing him. The lighting change contrasts with the previous lighting: as the trial is much more formal, the public would know about it and might be involved whereas in the tower it is much more secluded and out of the way. the show furthered because you only see the plane crash before they all go unconscious in mid air. Thanks to this, the audience do not know where they are so "Lost" is lost in terms of time and space. Leading audiences to arrive at their own conclusions as to what exactly is going on. Throughout this passage Jerry holds the upper hand in the private games and struggle for status and power that the pair have which is at times subliminal. Jerry's speech at the beginning of the scene about the irrationality of the fact that they are fighting over a bench shows this well. Study the language of home shopping channels. All the modifiers that the presenter uses all create a positive image but without really telling the audience anything about the product. By combining adjectives with nouns, adverbs and verb modifiers, the presenter can convey a sense of a product's uniqueness. Being all men it meant that a lot of different opinions were voiced, and that meant that we couldn't agree on everything. However, as a whole we did have some good ideas. I think the idea to physicalise the 1st scene was good as was the idea to show the never-ending corruption of men by showing the last scene. Love&amp;amp;#146;s Labour&amp;amp;#146;s Lost: Kenneth Branagh.